Despite what historians might call a messy history, Cleopatra lives on in popular culture and general memory as early human history’s most powerful woman. Sure, she co-ruled with a bunch of forgotten brothers and husbands, but they’re just that: forgotten. There’s a lot required of even a pharaoh like Cleo to etch their image into historical record through millenia. 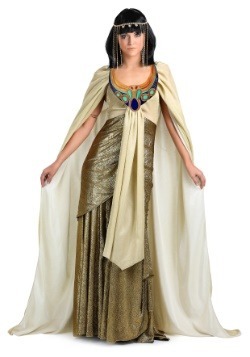 Enemies were indeed provoked, some ethically dubious decisions were made, and a wig like this fortified her identity as unmistakably Egyptian—even though she was greek! More than just a wig, this headpiece sports metallic gold ribbon accents to assert your importance. The synthetic hair is long, straight, and dark featuring bangs and multiple narrow braids. No one will question that you mean business. How might you wield the power that comes with being early human history’s most powerful woman? How might you preside over legions of followers in the modern era? We don’t know if you’ll immortalize yourself, but we certainly won’t rule out the possibility. 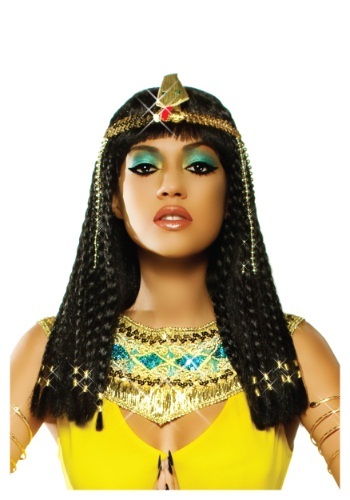 We’ll even offer you this Queen Cleopatra Wig to get you on the right path. Just please, in your quest for eternal recognition, try not to start any wars. Having provided you with the look that started it all, we just couldn’t bear that kind of guilt. 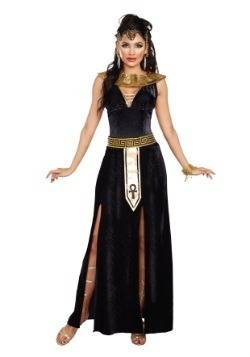 Perhaps live life with the same wit and charm that inspired Cleopatra’s contemporaries and that will be enough to read your name in the history books of 4000 A.D.